Originally published on Triple Pundit - see here. Last month, a Peruvian farmer called on German energy company RWE to pay its fair share to protect his home from imminent flooding caused by a glacial lake melted by global warming. “For a long time, my father and I have thought that those who cause climate change should help solve the problems it causes,” Saul Luciano Lliuya told the Guardian. He holds that RWE, one of Europe’s largest emitters of carbon, has contributed to the greenhouse effect causing glacial melting that endangers his home, along with many others in the city of Huaraz. Lliuya’s story illustrates the tangible human impacts of climate change, which can easily be forgotten amidst high-level debates over carbon emissions reductions. This is a key year for climate action by both governments and companies. In the lead-up to the much-anticipated Paris climate talks, states are preparing their pledges, and business leaders are developing their approach at meetings such as the Business & Climate Summit this week. Despite devastating impacts of climate change on the rights to health, water, food, housing, livelihood and life, human rights have been on the sidelines of these discussions. Bringing human rights into the center of discussions would reinforce the call on states and businesses to step up their game. International experts, including former president of Ireland and United Nations High Commissioner for Human Rights, Mary Robinson, have recognized that a human rights focus would strengthen the Paris climate deal. 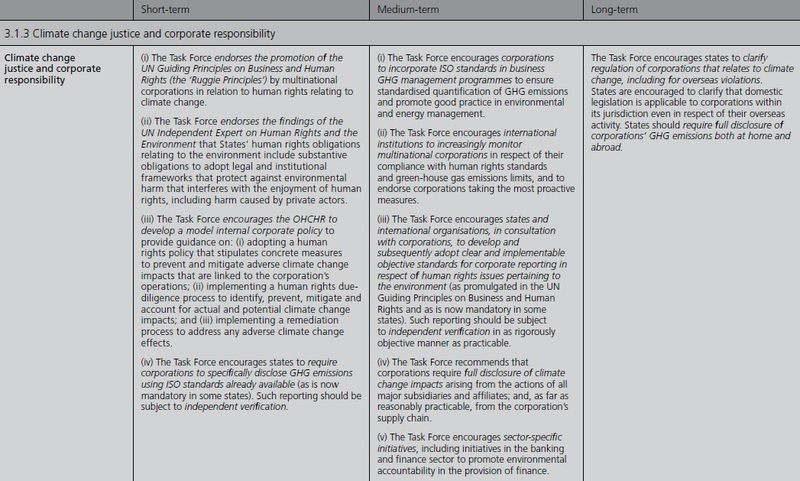 The International Bar Association’s Task Force on Climate Change Justice and Human Rights also established the links between climate justice and corporate responsibility, recommending clear steps for companies. As Unilever’s CEO Paul Polman puts it, “We can only solve the immense climate issues we face if we also address the human dimension.” However, climate change and human rights are addressed in siloes even within many of the most advanced companies. Making the link clear would allow internal human rights and environmental (or sustainability) champions to push for bolder action within their companies and deliver stronger benefits for the most vulnerable. Protecting the vulnerable from climate change impacts can be integrated into existing approaches to climate action, such as mitigation – i.e. reducing carbon emissions – and adaptation – helping communities strengthen their resilience in the face of climate impacts. In their mitigation steps, internal human rights champions can argue for bold greenhouse emission reduction targets citing the devastating impacts of climate change on rights to life, health, housing, water and food. Although some companies are stepping up their commitments on mitigation, the approach is far from universal. A report by the New Climate Institute suggests that the current EU greenhouse gas reduction pledge would prevent 6,000 premature deaths from air pollution. If strengthened further, it could prevent an additional 40,000. Making these types of links clear in a business context will help bolster the argument for more ambitious targets for reducing greenhouse gas emissions. Companies are increasingly recognizing the need to adapt their supply chains to a changing environment brought about by climate change. However, if fundamental rights are not recognized in the process, there is a danger that adaptation efforts can leave behind vulnerable farmers and communities at the bottom of supply chains. This risk is especially acute in the food and agriculture industry, where companies are feeling the pressure to change their approach to producing crops that are highly sensitive to climate change. A recent study found that arabica coffee is facing serious risks from higher temperatures and flooding, which would affect 25 million small farmers who rely on coffee for their livelihoods. Instead of moving production, the study suggests working with local farmers to develop new approaches to production and introduce climate resistant plant varieties. Oxfam‘s Behind the Brands campaign has recently called on General Mills and Kellogg to implement a number of steps on climate change, including clear adaptation strategies taking into account the needs of small-scale farmers. The companies have agreed to a roadmap of actions that they are currently implementing, which is a commendable step forward. Oxfam is calling on all of the “Big 10” food and beverage companies to follow suit. Adaptation also involves responsible management of resources essential for the survival of the food industry, such as water and land. Scarcity of the same resources has devastating impacts on families trying to feed their children, communities accessing water and farmer’ livelihoods. Acknowledging this inherent conflict is essential to ensure that basic rights of local communities are respected. However, according to a recent study by Ceres, only 7 out of 37 companies acknowledged that “access to drinking water and sanitation are fundamental human rights.” Raising awareness internally about the importance of human rights would bring about a less conflictual and more just adaptation process. Now is the time for companies to live up to their potential on responsible climate action. Current and future generations’ health, housing and life depends it. Putting human rights at the center of business action on climate change not only provides tangible framework by which to act, but it also ensures that business addresses the impacts on the most vulnerable.